We paint our 25×25 ft Cyc wall every month, plus we can arrange to paint it before your shoot! 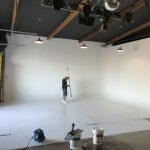 This commercial client asked for it to be painted prior to shooting, so Nader and I hit it with a fresh coat of white yesterday! 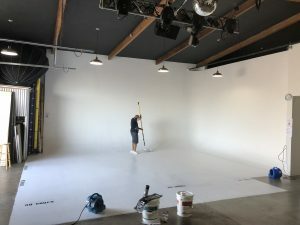 Be sure to book an appointment to come see our 50×32′ Studio with Garage door and have MORE space for your next commercial shoot.